Red Bull Racing had mixed fortunes during free practice for the Austrian Grand Prix on Friday. Max Verstappen damaged his front wing over the high curbs before breaking the suspension later in the session during the first 90-minute practice on his way to eighth place. The second session was interrupted by a torrential downpour, leaving the paddock to wait for the track to dry. But after half an hour delay, the cars emerged again to get some wet-weather data, with forecasts predicting the potential for a wet race come Sunday. 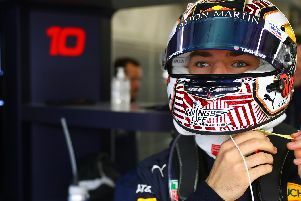 Despite a small spin from Verstappen, the Dutchman avoided further need for repairs to his RB12 as he improved to a 1:08.761 and seventh in the second session. Ricciardo remained in fifth, but couldn’t improve on his FP1 time of 1:08.528, setting 1:08.649 in FP2.